The Nestle Boost Kid Essentials 1.5 Nutrition Strawberry 8oz Case of 27, Model #335900, is anchored in advanced science and research. Nestle Healthcare Nutrition offers nutritional solutions for people with specific dietary needs related to illness, disease states or the special challenges of different life stages. The Nestle Boost Kid Essentials 1.5 Nutrition Strawberry 8oz Case of 27 is a nutritionally complete pediatric drink that delivers more calories in less volume than a standard 1.0 calorie drink. May be consumed orally or used as a tube feeding. Delivers more calories per serving than standard 1.0 formulas. Meets the 2011 IOM recommendations for calcium & vitamin D.
Nutritionally complete formula for tube feeding or oral use. 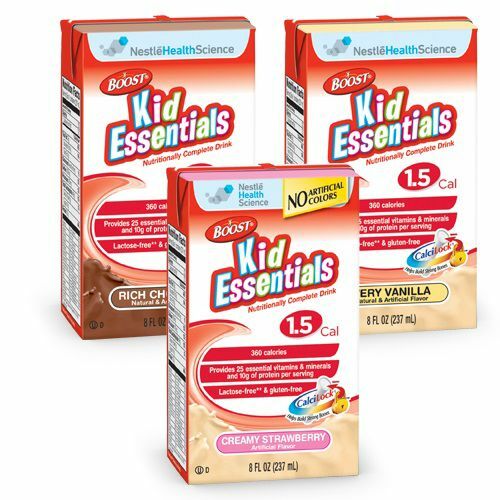 Case of 27 Boost Kid Essentials 1.5 8oz Tetra Brik.